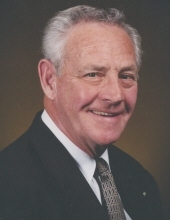 Robert Joseph “Bob” Cavill, a resident of Commerce Township and former resident of Garden City and Dearborn Heights, passed peacefully on September 8, 2018 at the age of 86. He was preceded in death by Eleanor, his beloved wife of nearly sixty-two years in 2014, son, Rob Cavill, on May 26, 2018 and sisters, Bonnie and Theresa. He is survived by his daughters, Cindy (Mark) Jenkins and Linda (Patrick) Pepiot; grandchildren, Derek Robert Nagler, Amy Elizabeth (Steve) Cullen, Natalie Marie Pepiot, Madeleine Pepiot; great-grandsons, Brady Kenneth and Maximilien Christian Cullen; brother-in-law, Bob (Joan) Somjak; sister-in-law, Agnes (Jack) Turchan as well as extended family, grand-pets, and many dear friends. Friends may visit Lynch & Sons Funeral Home, 404 E. Liberty St., Milford on Thursday, September 13, 2018 from 3-8 PM. Funeral Mass from St. Mary Our Lady of the Snows, 1955 E. Commerce St., Milford on Friday, September 14, 2018 at 11 AM with Msgr. John Budde officiating. In lieu of flowers, memorial contributions may be made in his name to Alzheimer's Association or Knights of Columbus. "Email Address" would like to share the life celebration of Robert J. Cavill. Click on the "link" to go to share a favorite memory or leave a condolence message for the family.